Lesson 5: Where Are You? Let's Learn English (ມາຮຽນອັງກິດນຳກັນ) ເປັນບົດຮຽນແນວໃໝ່ ສຳລັບຜູ້ຢາກຮຽນພາສາອັງກິດ. ພວກນາຍຄູສອນພາສາອັງກິດແບບອາເມຣິກັນ ໄດ້ອອກແບບບົດຮຽນນີ້ ສຳລັບພວກທີ່ເລີ້ມຕົ້ນໃໝ່. ບົດຮຽນຈະດຳເນີນໄປເລື້ອຍໆເປັນເວລາ 52 ອາທິດ. ໃນແຕ່ລະອາທິດ ຈະມີບົດຮຽນໃໝ່ ພ້ອມດ້ວຍວີດີໂອ ສະແດງໃຫ້ເຫັນ ຊີວິດຂອງພວກຊາວໜຸ່ມອາເມຣິກັນ. ບົດຮຽນດັ່ງກ່າວ ແມ່ນຮວມທັງຄຳແນະນຳ ໃນການເວົ້າ, ຄຳສັບ ແລະການຂຽນ. ນອກນັ້ນ ຍັງມີບົດຝຶກຫັດທີ່ພິມໄດ້, ການຊັ່ງຊາ ແລະການວາງແຜນຮຽນສຳລັບສ່ວນບຸກຄົນ ແລະນາຍຄູສອນອັງກິດ. ພວກເຮົາຢາກຊຸກຍູ້ໃຫ້ທ່ານຕິດຕາມບົດຮຽນປະຈຳ ອາທິດ ແລະໂອ້ລົມກ່ຽວກັບຄວາມກ້າວໜ້າຂອງທ່ານກັບພວກເຮົາ ໂດຍຜ່ານທາງບົດ ຄວາມເຫັນແລະໂດຍທາງອີແມລ. Anna visits Marsha at a friend's house. Anna and Marsha see many rooms in the house. They talk about what people do in each room. Anna ໄປຢ້ຽມ Marsha ທີ່ເຮືອນໝູ່ລາວ.​ Anna ແລະ Marsha ເຫັນມີຫຼາຍຫ້ອງ ຢູ່ໃນເຮືອນ. ເຂົາເຈົ້າລົມກັນວ່າ ຜູ້ຄົນເຮັດຫຍັງ ຢູ່ໃນແຕ່ລະຫ້ອງ. Watch the video and practice speaking. You can also download the worksheet and practice talking about the rooms in a house with a friend. Learn two different ways to ask questions in this video. Anna: Hello, everyone! Today my friend Marsha is at her friend's house. She says it is beautiful. I want to see this house! Here we are! Anna: Marsha, I am in the kitchen! It is a beautiful kitchen! Marsha: It is beautiful. We cook in the kitchen. Anna: I eat in the kitchen. Marsha: We relax in the living room. Anna: I relax in the living room. Marsha, let’s go upstairs! Marsha: Anna? Where are you? Anna: Marsha, I am in the bathroom! I wash in the bathroom. Marsha: I am in the bedroom. We sleep in the bedroom. Anna: I sleep in the bedroom! What are some of the rooms in your house? Write to us in the Comments section. Tell us what you do in the rooms. Learning Strategies are the thoughts and actions that help make learning easier or more effective. Plan to Learn is an important learning strategy because it helps you arrange your best learning conditions. You organize the resources and tools you need to study well. Here is an example of how to use this strategy. Oluchi knows she needs to have a quiet place to study. She takes her English homework to a quiet corner of her home, and turns off her phone and radio. She brings a cup of coffee to help her stay awake. She makes sure her dictionary is near and that she has pencils and paper to write notes. When she begins studying, everything she needs is in easy reach. Her full attention can focus on what she wants to learn. How about you? What conditions help you to study better? Some people like a little background noise, like in a cafe. Others need a very quiet place. Do you have a favorite chair or place in your home where you study well? Do you work better when you study with a friend or in a small group? Write to us in the Comments section or send us an email about your best learning conditions. Teachers, see the Lesson Plan for more details on teaching this strategy. Desktop Computer: Click here to take the listening quiz. Click on the button below if you are on a mobile device or our mobile site. ​Each question has a short video. Play the video and listen for information about people’s locations. Listening Quiz - Lesson 5: Where are you? Each Let's Learn English lesson has an Activity Sheet for extra practice on your own or in the classroom. 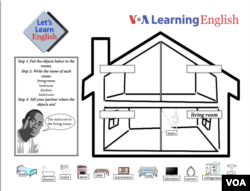 In this lesson, you can use it to practice writing the names of rooms in a house. 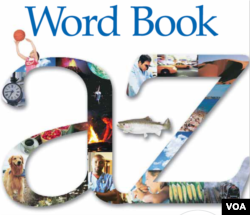 ​See the Lesson Plan for this lesson for ideas and more teaching resources. Send us an email if you have comments on this course or questions.